Properly storing your soapy creations extends the amount of time the product looks and feels its best. For cold process soap, proper storage includes plenty of air flow. On the other hand, melt and pour soap should be wrapped immediately. Improper storage can promote dreaded orange spots, faded colors and glycerin dew. Luckily, it’s easy to prevent these problems with a little know-how. How products should be stored largely depends on what the product is made of, and the shelf life of the ingredients. 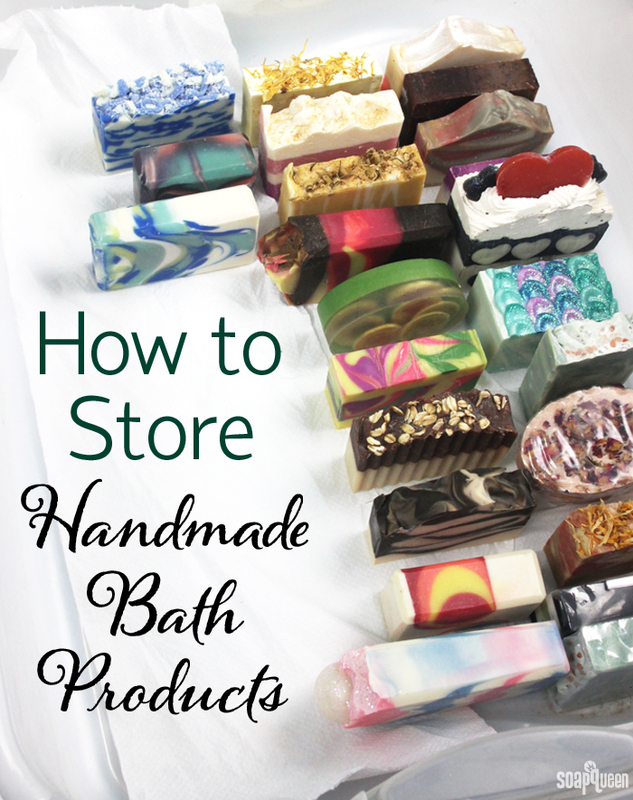 For nearly all bath and beauty products, it’s best to store them in a dry and cool place. Excessive moisture in the air can promote DOS (read more about DOS here) and cause bath bombs to prematurely fizz. Extreme heat can cause melt and pour (or even cold process) soap to melt, and the texture of lotions and balms to change. If placed in direct sunlight, soapy colors and fragrances may fade. If you live in a hot climate, find the coolest and darkest area of your home to store your products. If you battle humidity in your area, some crafters invest in a dehumidifier to help reduce the amount of moisture in the air.